The Manitoba Wildlife Federation is excited to announce that the Progressive Conservative Party of Manitoba has announced their vow to eliminate spotlighting in Manitoba. 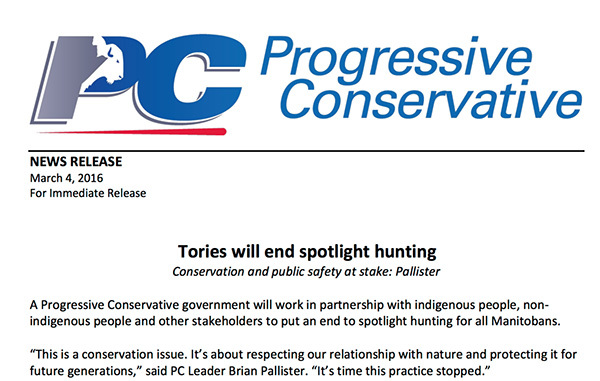 “A Progressive Conservative government will work in partnership with indigenous people, non­indigenous people and other stakeholders to put an end to spotlight hunting for all Manitobans. Animals are mesmerized by the lights and will stand for extended periods of time – much longer than during the day. They are transfixed by the light and have nothing even resembling a fair chance. “Spotlighting is a public safety issue as well. It’s dangerous to people, property and livestock,” Pallister added. This announcement comes in the wake of a press conference that the Manitoba Wildlife Federation (MWF) held February 16th, 2016 in which the MWF took the lead in calling for an outright ban on spotlighting in the populated portions of Manitoba to protect people, pets, farm animals and private property. The MWF used a dramatic re-enactment to illustrate the dangers of spotlighting by demonstrating how hunters are unable to see what’s behind their target – or exactly what their target really is. Along with the risk to people, numerous livestock have been killed or maimed by hunters using spotlights at night. MWF President, Brian Strauman, says following safe practices and training is the key to safe hunting. “One of the fundamental principles of safe hunting is knowing your target. But how can you possibly be sure of your target at night,” said Strauman. The MWF is urging the Liberal Party as well as the New Democratic Party to follow suite in taking action to end spotlighting in Manitoba to ensure the safety and security of Manitobans throughout the province. There are other issues surrounding spotlighting which are outlined on a new MWF webpage – NightWatch. The NightWatch campaign clearly states the case for the ban on spotlighting and provides an opportunity for rural residents to come forward with their spotlighting stories and for all Manitobans to register their concerns regarding spotlighting in their communities.